The Legal Person : What is its Nature? So, if we are not in reality, unless we claim to be so, a legal person, then how would we best describe our relationship to it? The former allows the Administration of the Trust, the latter becomes the Debt Ledger within the Trust. As a split title the legal entity has as the Beneficiary, the government, because they created it, therefore they are the Beneficiary and can determine who has power of attorney for it. But everything they have carried out has been through a deception as an act of war. Title is the means by which you are recognised by the land based government which has the role of securing all the inherent rights to those born on the land. The original Title from which all others are formed, is the Record formed at the Registration of the Live Birth. This belongs to your mother and father because they created it, the state recorded it and held it in Trust. The Government since the early 1800s, has played a deception, they withheld your Title, split it into two, forming a Title they own, the certificate of which, they send to you and that is called a Birth Certificate, which up until recently made it very clear that it must not be used as a form of ID. The Governments today are no longer what we call a Representative Government or De-Jure government, they have Incorporated and thus changed jurisdiction completely. Today we suffer De-facto Governments that pretend to represent you the public while in full knowledge that they do not. That is the two faced eagle of the Scottish Rite, the Templar Masons. Full Study. If you take a salary from the government you have become an employee of it, to receive benefits you are acting under the split title under contract, because governments are now corporations are can only operate by contracts. Government legislation is for Government employees to follow, this is to protect the creditors, the taxpayers, from law suits through harm or loss due to government employees. Legislation is there to protect the government from being sued by the populations. Something has gone wrong. Therefore we can claim that the split Title, the mimic, of the flesh and blood Man, is a fictitious person that has an identity in Commerce. A legal person can be sued and can sue, not within the realm of law but in the realm of commerce. It is a separate entity from the flesh and blood Man but through some serious wizardry, they have you contract through it and therefore gain a hold on your real property, goods and land. The best way to better understand the relationship we would want, if we had all the facts, with the invented legal person denoted in the uppercase, would be to gather some of those facts, for that we can look at definitions of the word person through the law books over a time frame. What is revealed is the fact, a legal person is a separate entity to who you are as a living flesh and blood Man. In this study we can also understand that shifts in the definitions of a legal person have been so to better suit corporate statutes (rules of contract) with the specific aim of setting as precedent, commercial statute regulation definitions over land law and thus the definitions accorded within the Realm. They are removing your Lawful inalienable rights to Legal privileges and benefits. They are doing with this with your tacit consent. A legal person is a company which carries out all the obligations and rights on its behalf. When establishing a business or an enterprise legal person, is the company laque assumes all it has to do with the rights and obligations of the same and not the owner himself. The implication is that all obligations and debts that the company has fully guaranteed and are only limited to anything with the company under its name and capital, and equity. Legal personality (also artificial personality, juridical personality, and juristic personality) is the characteristic of a non-human entity regarded by law to have the status of a person. 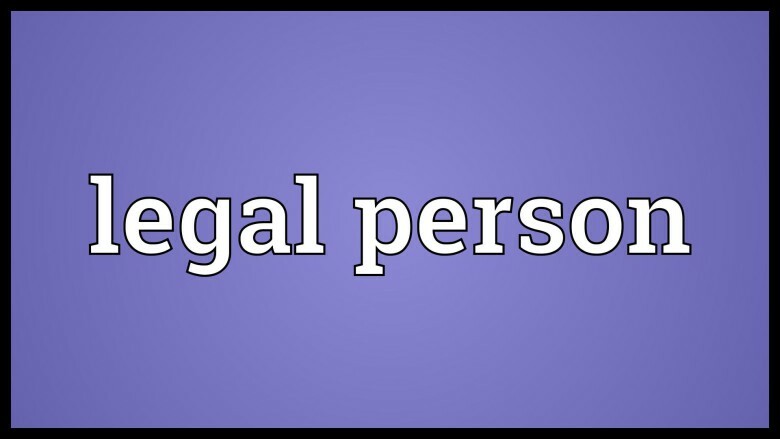 A legal person (Latin: persona dicta), (also artificial person, juridical person, juristic person, and body corporate, also commonly called a vehicle) has a legal name and has rights, protections, privileges, responsibilities, and liabilities under law, just as natural persons (Man) does. The concept of a legal person is a fundamental legal fiction. It is pertinent to the philosophy of law, as is essential to laws affecting a corporation (corporations law) (the law of business associations). Legal personality allows one or more natural persons to act as a single entity (a composite person) for legal purposes. In many jurisdictions, legal personality allows such composite to be considered under law separately from its individual members or shareholders. They may sue and be sued, enter into contracts, incur debt, and have ownership over property. Entities with legal personality may also be subject to certain legal obligations, such as the payment of tax. An entity with legal personality may shield its shareholders from personal liability. The concept of legal personality is not absolute. Piercing the corporate veil refers to looking at individual human agents involved in a corporate action or decision; this may result in a legal decision in which the rights or duties of a corporation are treated as the rights or liabilities of that corporation’s shareholders or directors. Generally, legal persons do not have all the same rights as natural persons for example, human rights or civil rights (including the, although the United States has become an exception in this regard). Person – The Revised Code of Washington, RCW 1.16.080, (I live in Washington State) defines a person as follows: The term person may be construed to include the United States, this state, or any state or territory, or any public or private corporation, as well as an individual. Person – Black’s Law Dictionary 6th Edition, pg. 791, defines person as follows: In general usage, a human being (i.e., natural person), though by statute term may include labor organisations, partnerships, associations, corporations, legal representatives, trustees, trustees in bankruptcy, or receivers. Legal person – Merriam-Webster’s Dictionary of Law 1996, defines a legal person as : a body of persons or an entity (as a corporation) considered as having many of the rights and responsibilities of a natural person and esp. the capacity to sue and be sued. A person according to the above definitions, is basically an entity legal fiction of some kind that has been legally created and has the legal capacity to be sued. Take note of the emission of the word lawful within these definitions? Well.. I am not the United States, this state, or any territory, or any public or private corporation. I am not labour organisations, partnerships, associations, corporations, legal representatives, trustees, trustees in bankruptcy, or receivers. So, I cannot be a person under this part of the definition. Individual – Black’s Law Dictionary 6th Edition, pg. 533, defines individual as follows: As a noun, this term denotes a single person as distinguished from a group or class, and also, very commonly, a private or natural person as distinguished from a partnership, corporation, or association; but it is said that this restrictive signification is not necessarily inherent in the word, and that it may, in proper cases, include artificial persons. Well, now, I have already been shown that I am not a person, and since individual denotes a single person as distinguished from a group or class, I can’t be an individual under this definition either. But I see the term natural person used in the definition of the RCW, and also in the definition of some of the Law Dictionaries. Maybe I am a natural person, since I know I am not an artificial one. Am I untouched by man (depends on what the word mana means), or by influences of civilisation? I don’t think so. Am I wild, or untutored? Nope, not I. Even though the definition states that this word is the opposite of the word artificial, it still does not describe who I believe I am. So I must conclude that I am not a natural person, under this definition of the word natural. So the term natural person cannot apply to me. Black’s Law Dictionary also used the term human being, and although Black’s defined it as a natural person, maybe they made a mistake, maybe I am a human being. Human or human being does not appear to have a legal definition, so I went to my old standby 1888 Noah Webster’s Dictionary for a vernacular definition of this word. Am I of the race of man? Rare and inelegant? Sprung of humans that inhabit earth (ground)? (I’m not coloured either.) Well, it looks like I have to define the word man through Webster’s because there appears to be no legal definition for man. Man – Webster’s 1888 Dictionary defines man as follows: An individual of the human race; a human being; a person. The Holy See (Sancta Sede) not to be confused with the Vatican City over whose independent territory the Holy See is sovereign is a subject of international law just as other states. Its possession of full legal personality in international law is shown by the fact that it maintains diplomatic relations with 178 states and that it is a member state in various intergovernmental international organisations, such as the United Nations and the WIPO. It would appear not even the Holy See has escaped form statutory consent, so to lay blame at the church itself is incorrect. Like all institutions today the statutes are restricting while determining thought and then action, and like any institution it only requires that the elite of an institution succumb to the pressure of the real power, commerce, and the whole ethos of that institution can be shifted in spite of those who are the clear majority of that institution, the priests and the congregation. The danger for the church comes in its move to allow commerce to rule its ethos which is the anti-thesis of the doctrines, and tied as she is to International law, then Statutory International law will determine what it is to be an emissary of the man who turned the tables of commerce. So we have interrogated the Legal Title which is the ‘Split Title’ created by the government, to split a title means there is another….